to the business, with the ability to demonstrate clear ROI and performance. It’s the great HR challenge – refocusing from transacting processes to influencing business leaders and making a positive contribution to the bottom line. From strategy development and technology selection to project delivery, specialist training and project resources, we help you deliver HR programmes that achieve lasting business change. We have decades of experience supporting global companies with complex initiatives, achieving buy-in at all levels to ensure sustainable success. As a result, our clients transform HR into an indispensable commercial partner to the business, with the ability to demonstrate clear ROI and performance. Many of our clients have undertaken HR projects in the past and not seen the promised results. Our proven methodology helps you avoid the common pitfalls and achieve measurable outcomes over the short, medium and long term. We bring a unique perspective to delivering HR change projects. As with other consultancies, our founding Directors have many years’ experience delivering large scale HR Transformation programmes. What makes us different is we’ve also held operational accountability for those functions after they’ve been transformed. We also advise on and lead remediation and turnaround projects, providing a unique insight into the things that can go wrong and how to avoid them. This hard won knowledge has been built into our methodology and accompanying toolkit. It starts with a simple assessment of the change you are looking to make. From the simplest process improvement project to the most complex global HR transformation, we can provide the most appropriate methodology from our toolkit. Business stakeholders are engaged at the very start of the project, their input sought and used to help shape project outcomes. On too many occasions, the first time the Business hears about HR projects is just before they go live. Once your project has begun Implementation, we work as a seamless part of your team, transferring knowledge as we deliver. Your HR team will have access to practical and intuitive project tools, templates, checklists and guidance that will ensure your project is delivered on time, to budget, with sustainable results. A common mistake is treating an HR Programme as individual, siloed Projects. Whilst each of the Projects may deliver on time, on budget and to expected quality, the outcome can be confusion, rework and lower than expected business benefits. More complex changes that impact multiple processes, systems, and/or team capabilities, organisation structures or jobs require an additional layer of Programme Management. The steps of the Scoping phase are the same as our Project methodology but contain a broader scope of activities. The key difference is that during Build, multiple Projects need to be co-ordinated and their plans and activities Integrated. Change Management takes a far greater priority in Programme delivery, specifically when Transitioning new capabilities out of Build into your business as usual operations. Underscore HR provides a pragmatic and proportionate approach to Programme Management that ensures expected improvements in HR and Business performance are delivered. Underscore HR has developed a proven approach to HR Transformation that turns your vision into reality. We achieve this by aligning a long term Transformation plan to your unique circumstances and ambitions. 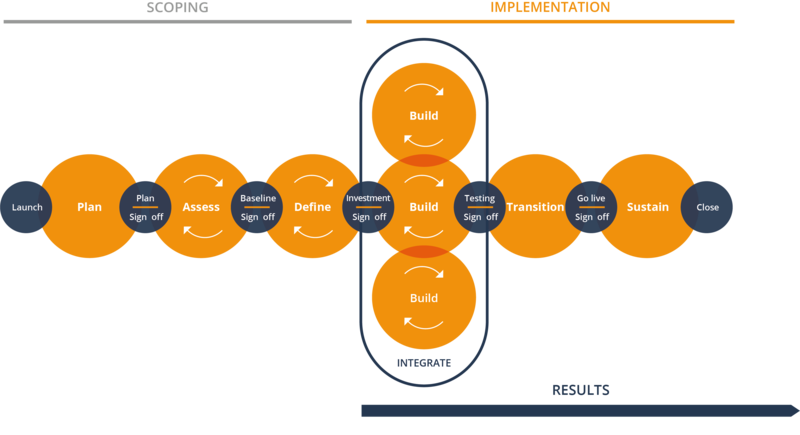 Your start point may be a major Infrastructure Programme to build new Operating Models, Systems, Processes and Teams. Equally, you may require a simpler Programme to refine and enhance some of your existing capabilities. Or the most effective approach may be embedding Continuous Improvement into the DNA of operational HR teams. For most multi-national organisations, the reality is a multi-faceted approach with different countries or organisations starting from different places and moving at different speeds. There truly is no one size fits all approach to HR Transformation. We can help build and deliver an appropriate Transformation plan for even the most complex matrix organisation. Then provide you with the expert resources, the tools and the capability to lead and manage change within your team. Transformation is done by you and for you, not to you. We’re not your traditional (and costly) consultancy that bolts on to the organisation and takes its expertise with it once the project is finished. We work as an integral part of your team, transferring knowledge and sharing in the risks and rewards of delivering substantive change. In fact, when we meet with your external partners and suppliers, they usually think we’re part of your organisation. With us, you get experts who are 100% focused on HR, giving you an agile, responsive team that helps you commercialise your HR function and achieve real, lasting value. As skilled users of people analytics and data, we produce meaningful market intelligence that benchmarks your HR function, underpins business decisions and directs performance. We help you capitalise on the best HR technology and embed it within the function, so you enjoy the business benefits while achieving fast ROI and a low cost of ownership. From process improvement to cost savings, we’re a partner truly aligned with your business goals. Together we deliver quantifiable and lasting value.